The Lan Party in full swing. 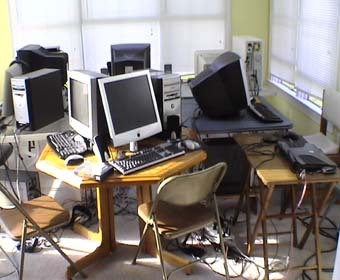 (8/06) Most of the people who read this will have no idea what a LAN party is. If that is the case, consider yourself lucky in your blissful ignorance. A few people who read this that will identify a LAN party as something that is lots of fun. That's nice, but this column wasn't really written with you in mind. For the third group of people, most likely parents with one or more teenage boys in their home, a LAN party is something you avoid hosting at all costs - but usually can't. A LAN party is a temporary, sometimes spontaneous gathering of people together with their computers, which they connect together in a local area network (LAN) primarily for the purpose of playing multiplayer computer games. Just to set the record straight, despite Wikipedia's assertion, a LAN party is never "spontaneous." It requires interconnecting enough electronic equipment to run a small third world country and supplying enough food (in the form of pizzas, chips and soda) to equip that same country's army for an invasion. Granted, we knew what we were getting into. This particular weekend wasn't the first time we hosted a LAN party. We already knew that it involved five or six teenage boys moving into our house overnight, bringing with them not only sleeping bags and (optionally) a change of clothes, but also more than half a dozen very bulky computers. Each of these machines isn't just a computer, but a gaming computer, which means they are at the extreme edge of computer performance. The games my son and his friends like to play have fast-moving action that put high-resolution 3D images on the screen. Players in these games who have a slow computer that lags behind are at a definite disadvantage and are more likely to get knocked off sooner. In the virtual world of Counterstrike or Unreal Tournament, that's a bad thing. The fact that these are all gaming computers means a few things: First, they are loaded with devices such as special graphics and sound cards that can cost as much as the computer itself. Because of this, are almost never a nice portable laptop that somebody can tuck under their arm and carry around. They always have enormous cases in order to hold all those extra cards and the extra large power supplies to run those cards. To be fair there are a few companies like Alienware that do make laptop gaming computers, but they tend to be prohibitively expensive, especially on a teenage budget. Besides, it is a lot easier to "mod" a big computer case than a laptop. Let me take a moment out from the LAN Party story to tell you about "moding." Most people are totally unaware there is a sub-culture of people - mostly college age or high school - who modify their computers with paint, lights and other add-ons to make it a showpiece ( a process a friend of mine refers to as "pimp my computer.") A typically modified computer - like my son's - includes a fancy case (ones in the shape of an alien head are popular) with an acrylic window on one side so people can see how much you spent on the expensive graphic and sound cards inside. Lighting is an integral part of these conversions and they can be made to glow with ghostly blue, green or red colors. Even the wiring and connectors inside can be made to glow as well as the keyboard and mouse. The cases' fan covers can be replaced with one carrying the insignia of your favorite game or maybe something threatening like a biohazard or radiation warning symbol. 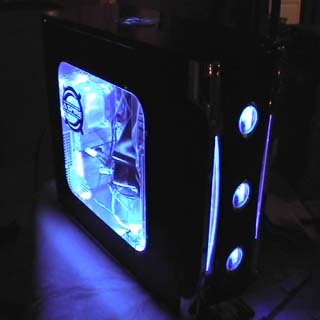 People who really want to go all out will actually start gluing things on their case, making their computer look like it is an object out of their favorite game. Moding your computer is a bit like "suping" up your car, but without all the greasy hands. Just as with an automobile, you don't make changes for appearance only. In the same way you can add a supercharger to your car to speed it up, it is possible to make your computer into a dragster too. This is usually done by "overclocking" the processor. Overclocking is a bit risky as making the processor go faster than it is designed for is likely to cause it to overheat and burn up. Since the processor is the most expensive part of the computer, a destroyed one can cost you many hundreds of dollars to replace. For this reason, people who want to overclock their computer must add even more equipment to it - usually more fans, or even a liquid based cooling system to keep the temperature down. Another reason why these machines have huge cases. Not not only are all these big computers coming into the house, but also all the associated equipment like network hubs, Ethernet cables, speaker systems (complete with sub-woofers capable of shaking the house to its foundations) and gigantic monitors that might seem to be more appropriate if mounted in a baseball stadium. After the last time we hosted my wife swore she would never do it again. She was forced to give in only because all the other parents in our son's circle of friends had pretty much taken their turn and the spinning bottle now pointed back to us. Her agreement to host another LAN party wasn't without some strings, however. Everyone had to agree to the following conditions: 1) They would go to bed by 2AM (LAN parties are often marathon events with the objective to see how long you can stay coherent while playing DOOM III), 2) The number of people attending would be limited to six and most importantly 3) I would be there to help for at least the evening portion of the event. Friday: 1530 hrs - My son is home from school and is asking me to help him set up the room. We have agreed that he can use the sunroom for this event as it is somewhat closed off from the rest of the house by a set of French doors. I'm hoping that by isolating the party in there we might avoid total disruption of the rest of our domicile. There is already one table set up in there and we get another folding table out of the basement. With those in position, my son announces that we don't have enough room as it looks like the tables will only hold four computers and he expects eight machines tonight along with their owners. This would seem to be counter to condition 2 of the above, but there is little that can be done about it now but scrounge more tables from the basement. 1630 hrs - We now have four tables up and most of the wiring is strung. My son and one of his friends have invested in buying a LAN hub and a pack of Ethernet cables, both of which are necessary to support the interconnection of the computers. This purchase not only ensures that they will be prepared for such high-tech festivities in the future, but, in a wily social move, guarantees that they will be invited to almost every LAN party thrown. 1700 hrs - The first guest arrives complete with both parents who each carry a vital part of the guest's computer system. The parents are smiling widely as they are a) happily anticipating having an evening to themselves and b) have successfully avoided hosting the party this time. 1805 hrs - It is rapidly becoming apparent that while each of our guests have remembered the important things - computer, monitor, power cables, etc., but nobody has remembered such niceties as pillows, sleeping bags, toothbrushes or blankets. Parents find themselves stopping back with these necessities. I notice they aren't smiling as much. 1835 hrs - Almost all the computers are up and running and the kids are playing some game that requires them to chase after each other through a dingy virtual reality world while shooting at one another and throwing grenades. Some of the kids are using headphones, but most have speaker systems with the dreaded sub-woofers. Electronic explosions rock the room and send vibrations through the house. Unfortunately the closed French doors have little effect except to add the sound of rattling window panes to each detonation. 2100 hrs - It has gotten dark and the sunroom now has taken on a surreal look. Eight teenage boys sit jammed around the four tables. The only light in the room are the computer screens into which they are staring or the glow creeping out from inside of the cases. One could imagine that like in some cheap sci-fi movie they are cooking up a scheme to set off a nuclear war and end the world. I hope they aren't, but who can tell? 2300 hrs - My wife and I try to get some sleep. It's a warm night and we need the windows open. This is unfortunate as the sound of automatic gun fire and the occasional explosion can easily be heard wafting up from the sunroom. Neighbors are driving by and peering into the sunroom wondering what is going on. Saturday: 0600hrs - I have to work today, but before I leave I check out the sunroom. There's no blearily-eyed teenager sitting at any of the eight computers jammed into the room, which is an improvement from last time. The room does look like it has been hit by some catastrophe, however. Cans of soda are strewn all over intermixed with empty pizza plates amid the high-tech equipment. The scene with the early morning sun streaming through the windows reminds me of a battlefield after all the soldiers have left: desolate and lifeless. I need only remind myself that the warriors are upstairs asleep, not dead, and will soon arise to do battle again. I smile. The party is not over till noon, but I'm going to work now.